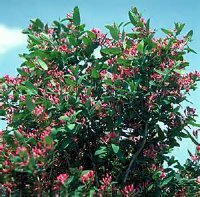 A medium-tall, open, irregular deciduous shrub with slender, spreading and arching branches. This cultivar was introduced by the University of Minnesota's Department of Horticultural Science and Landscape Architecture. Resistant to the Russian Honeysuckle aphid. Dull-colored foliage.